Alan Moulder (born June 11, 1959) is one of Britain's premier alternative rock record producers and is considered by many a major architect of the modern British rock sound. Alan Moulder has worked with many bands, including: The Jesus and Mary Chain, My Bloody Valentine, The Smashing Pumpkins, Moby, The Cure, Curve (featuring his wife, Toni Halliday), A Perfect Circle, The Secret Machines, The Killers, Gary Numan, and of course, Nine Inch Nails. 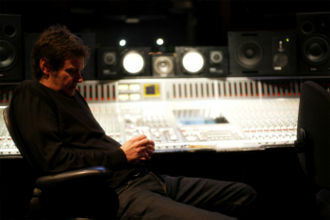 His work with NIN led to him engineering various other albums for Trent Reznor's Nothing Records, including Marilyn Manson's debut Portrait of an American Family and Prick's eponymous album. Moulder was also involved in the Saul Williams album The Inevitable Rise And Liberation Of NiggyTardust!, which also saw contributions from Reznor. He has also collaborated as mixing engineer with How To Destroy Angels and HEALTH, and mixed the Gone Girl Soundtrack for Reznor and Atticus Ross. Things Falling Apart - mixing on "Slipping Away", "The Great Collapse" and "Metal"
This page was last modified on 26 June 2018, at 16:42. This page has been accessed 70,926 times.